Michy Batshuayi scores twice as Belgium beat Iceland to take them three points clear at the top of their Nations League group. 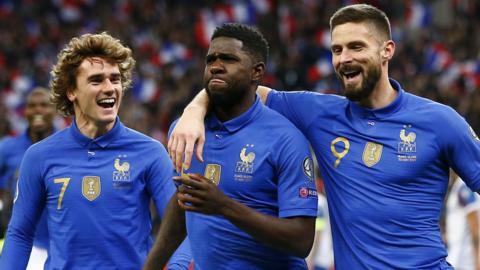 Substitute Kylian Mbappe is the catalyst for a dramatic France comeback as Iceland are denied a first win over the world champions. Xherdan Shaqiri scores one goal and has a hand in two others as Switzerland thrash Iceland in the Uefa Nations League. Style or substance for Nordic nations? Read more on Style or substance for Nordic nations? How did you rate Argentina & Iceland players? Read more on How did you rate Argentina & Iceland players? Watch all the best action and funnies from day 13 of the 2018 World Cup in Russia, as Lionel Messi finally makes his mark on the tournament just when Argentina needed him most. 'We will open Iceland up' - BBC pundit Danny Murphy gives his verdict on England's opponents in the last 16 at Euro 2016.